I can’t say that I always appreciated my Jewish upbringing. But, ever since I became a follower of Jesus understanding the Hebraic backdrop of Scripture has been monumental in my life. Not only did Jesus use practical object lessons in nature, etc. but He also spoke of things in context of the Old Testament backdrop so that listeners would get it. If you ever have an opportunity while in Israel to tour the Old City, make sure you get to the Southern Steps of the Temple Mount. It actually is one of the rare locations where we can say literally that Jesus walked there. 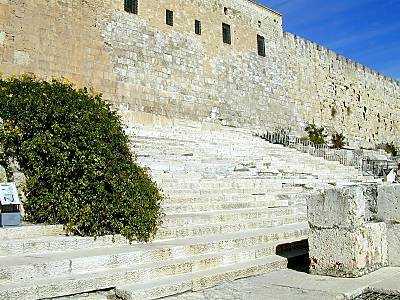 While a good portion of First Century Jerusalem is well underground, such is not the case with the Southern Steps. They’ve been wonderfully preserved since the First Century. On one of our trips to Israel we had been taking a break from some excellent but intense teaching regarding Jesus’ ministry around the Temple area when our tour guide through in a nugget for free! He asked us to notice that the steps leading up to the wall at the Southern Steps were actually irregular in structure. Most of us are used to steps that are all the same length, height and width. Not so, these steps. He pointed out from Jewish culture that some are a wider steps than others. Some are thinner than others. What was the point? The steps were constructed in such a way that as worshipper ascended to the Temple Mount they would have to pay attention to where they were stepping. There are fifteen wide steps out of the total and some suggest that they may have been one of the locations where pilgrims sang the fifteen Psalms of Ascent (120-34) as they went up to worship. Each step would keep them in the rhythm of the Psalm. This process would literally force them to keep their focus on the lyrics of the psalms and thus, stay in step with God’s truth. So, how does this apply to your situation right now? God has a perfect rhythm for our life. He doesn’t want us to get ahead, yet He doesn’t want us to lag behind – He wants us to keep in step with Him. Dare I say that this rhythm is different for each person? Maybe this is where we get the idea, “That person is marching to the beat of a different drummer”. That’s not always bad. In fact, it could be very liberating to discover your own rhythm with God and not worry what someone else’s rhythm is like. As you trust Him, stay in step with God’s plan for YOU!